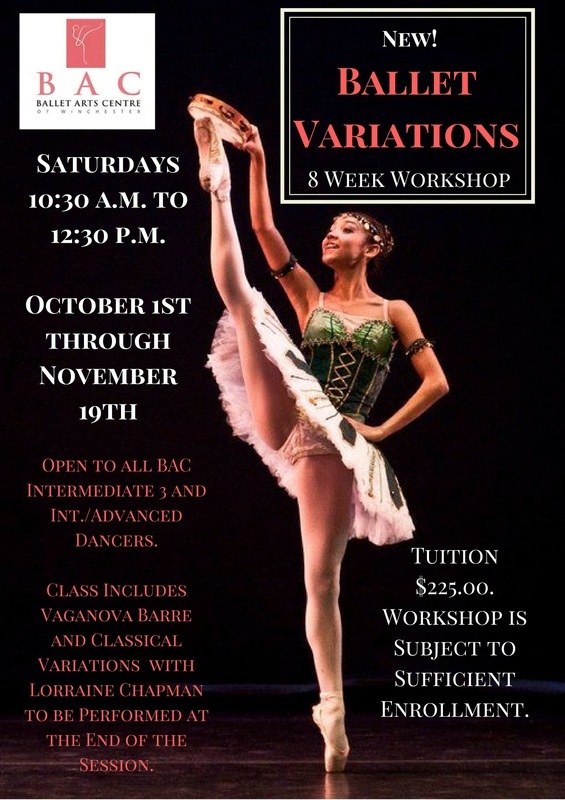 Fall 2016 Variations Workshop - Ballet Arts Centre of Winchester, Inc. Improve Your Ballet Technique and Build Your Ballet Confidence! This class is open to all Intermediate 3 and Intermediate/Advanced students. This 8-week workshop will meet on Saturdays from 10:30AM - 12:30PM from October 1st through November 19th with an informal presentation after the end of the workshop on November 19th. The cost for this workshop is $225.00. "The Vaganova method is a ballet technique and training system devised by the Russian dancer and pedagogue Agrippina Vaganova (1879–1951). It fuses elements of traditional French style from the romantic era with the athleticism and virtuosity of Italian technique. The training system is designed to involve the whole body in every movement, with equal attention paid to the upper body, legs and feet. Vaganova believed that this approach increases consciousness of the body, thus creating a harmony of movement and greater expressive range." Miss Lorraine's "Vaganova Barre Work & Classical Variations Workshop" will begin with a selection of Vaganova syllabus exercises at the barre that are repeated and built upon with each class. Students will learn the proper coordination of upper half and lower half as well as reaping the benefits of the set, strengthening work. These benefits include better turn-out, balance, poise, extension and dynamics. For the remainder of class the students will then learn a classical ballet variation wherein they will apply what they have gained at the barre! - similar to the way they apply arithmetic to mathematical practices. They will also learn the history associated with the variation. The students will concentrate on several classical ballet variations throughout the workshop. The repetition will allow them to really dig in and apply a high level of attention to detail to their work. The goal is for the students to feel secure and confident with their ballet technique in new, exciting, and empowering ways! Students will be allowed to take either all or portions of the class en pointe at Miss Lorraine's discretion. Workshop is subject to sufficient enrollment. Tuition is non-refundable after September 30th.